The Georgia House of Representatives this week honored ABA Chairman Dan Blanton for his leadership in the banking industry. The Georgia House of Representatives this week honored ABA Chairman Dan Blanton for his leadership in the banking industry. During a ceremony today at Georgia Bank & Trust’s historic branch in downtown Augusta, State Rep. Barbara Sims presented Blanton with a resolution signed by Gov. Nathan Deal. 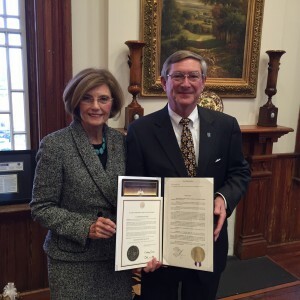 The House resolution commended Blanton for his leadership as a bank CEO, chairman of the Georgia Bankers Association, chairman of ABA’s Community Bankers Council and now ABA’s board chairman. It also cited his service to Augusta through his business activities and charitable involvement.